For anyone who follows me on Goodreads, you may have noticed how terrible I am about updating my reading lists. Several reasons for that. One, my reading habits are often random and sporadic. Two, as someone who's trying to walk a fine line between being honest and yet not putting a stumbling block in front of others, I may not always want to admit what exactly I'm reading ("do you have freedom? good, enjoy it between yourself and God and not before those who would be offended"--a rough paraphrase about "meats offered to idols" issues). Three: I might be reading for contest judging and can't really SAY that. Of the ones I admit to reading, I review even fewer. Part of that is because I know I'm picky ... I hate hurting people's feelings ... and I'm blessed with SO MANY writing friends that I can't possibly read everyone's stories, much less be perfectly objective about the writing. 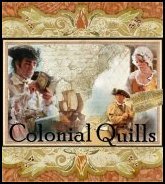 I did recently offer to read and review a novella written by a fellow Colonial Quills author, Tamera Kraft. It was a very good story, lingered with me long after I finished it, and yet I only gave it 4 stars. For starters, Goodreads has a slightly different rating style than, say, Amazon. 4 stars according to Goodreads is "I really liked it" while 5 is "it was amazing!" I rarely give books a 5-star rating anymore unless I'm just head-over-heels in love with it ... but I've read a lot of perfectly good stories, perfectly enjoyable ones, that might not peg the "amazing" in me because of some nitpick or another. So they get 4 stars. I'm a writer too, for crying out loud. And studying the craft tends to bring out the nasty internal editor. It's been a hard fight to regain the love of reading for its own sake. This year, because of the prodigious (for me) number of books I've read already (many of them contest reads), I decided to keep track. As of last night I've read a total of at least 65 novels and novellas, just this year. If that seems excessive, I assure you my husband and children read a lot faster than I do! I won't tell you everything I read but I might, just for fun, tell you about some new favorite authors, and what I like about what they do. In the meantime, if I've reviewed your work in the past, or if I happen to offer a review in the future, please try not to be disappointed if I "only" give you 4 starts. Because after all, 3 stars on Amazon might translate as a "meh," but Goodreads says it's "I liked it." :) But if I feel like I can't give you at least 4 stars, I probably won't write a review. A young woman still grieving the loss of her fiancé, a young man determined to take care of her as penance for that loss ... he knows he’s no substitute for his friend, who died in the Great War, but he’s loved her forever. One problem, though ... he can’t risk telling her how he really feels. The opening scene of this story sucked me right in. The rest is a little slower, a little less emotionally gripping, but this is a very sweet story. I could feel the ache and weariness of Vivian’s grief, of her struggle for Henry’s attention and approval. Though painful at times, the emotional and spiritual journey of both characters is brought to a beautiful and satisfying conclusion.